Stuart's Photography - » Merthyr Road: Silliness At Sardis Road? Merthyr Road: Silliness At Sardis Road? Posted by Stuart Herbert on July 30th, 2010 in Modern, Photos, Pontypridd, Shoot, Taff Vale Railway (Modern-day Valley Lines). 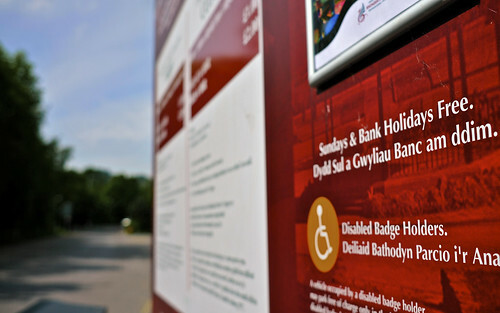 There are several stations along the old Taff Vale Railway that provide park and ride facilities – most notably at Trefforest and Taffs Well. Sadly, despite being one of the major towns along the route (arguably the most major other than Merthyr at one end and Cardiff at the other! ), Pontypridd does not provide such a scheme. 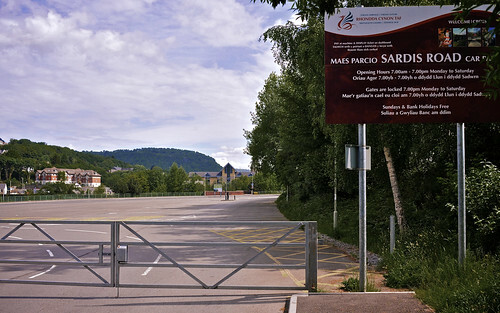 What we have instead is the car park at Sardis Road. It’s a pay and display car park, but the all-day parking charges are pretty reasonable. And, on Sundays and Bank Holidays, car parking is free. There’s just a couple of problems with that. First of all, the car park is only open from 7am to 7pm. If you’re a commuter who needs to be heading into Cardiff before 7am, you can’t park here. And if you’re a commuter who can’t be sure of making it back to rescue the car on time, you can park here, but you’ll have to come back the following day to rescue your car. Secondly, as the sign says, the gates are locked at 7pm Monday to Saturday. So how exactly are you supposed to park for free on a Sunday if the gates are still locked …? Just to be certain that it wasn’t a mistake on the one sign, I popped down to the other sign and checked that too. They are consistent. The locked gates on a Sunday also means that the recycling bins hosted in the car park aren’t easily accessible if you’re too old or otherwise infirm to carry the waste from the road. I’m sure that Rhondda Cynon Taff council must have good reasons for these restrictions, but they are very commuter unfriendly. Commuters needing to drive to the railway station are probably much better off driving to Trefforest or Taffs Well, especially if you’re likely to have to work late unexpectedly or if you need to commute on a Sunday.